I have the privilege of meeting a lot of wonderful, knowledgeable people through my job. Visitors to the museum are often eager to share stories from their family. 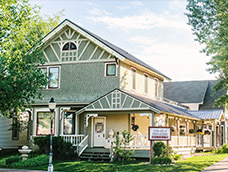 The museum�s 1908 Victorian House, home of the Zimmerman family, resembles the homes from people�s past and folks emerge from the home feeling reminiscent. Mission accomplished! I�ve heard from people remembering grandmothers bent over coal stoves, like the one in our kitchen, creating some of the best bread and treats, without a temperature gauge or modern appliances and mixers. The museum�s Victorian house is filled with many wonderful, subtle items. These small features to the house often go unnoticed, or in my case, seen so often they are taken for granted. 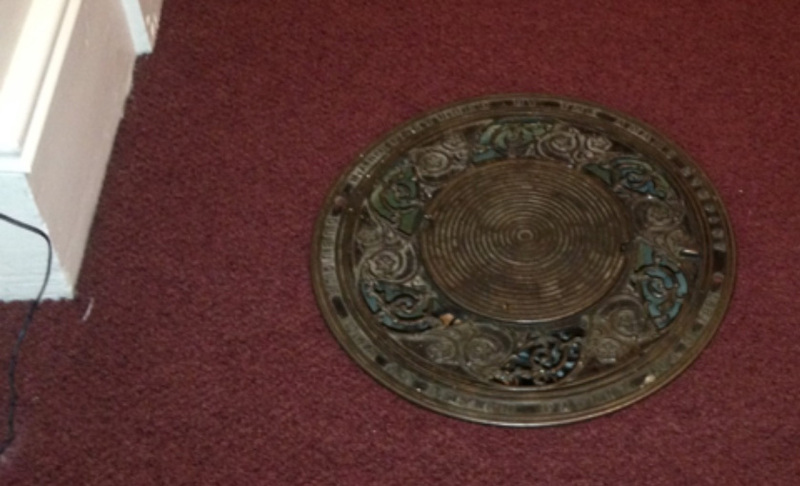 Recently I have received a lot of questions about the �black circles,� as one visitor called them, in the floors. The black circles are vents or floor registers, installed to help warm the upper level of the home. The only heat source was located in the kitchen, a.k.a. grandmother�s stove (more about that later). Wealthy families may have had additional fireplaces, but seldom had a fireplace in the bedroom. The heat from the kitchen stove, which was lit the majority of the year, rose up and provided (meager) heat to the upper bedrooms. I personally despise a drafty house, so I probably wouldn�t have made the best Victorian lady, nor a very good pioneer. Not only did they work hard all day while maintaining proper attire and poise, but they also spent a lot of time in the kitchen�not my strong suit. The museum�s Victorian kitchen exhibit is absolutely my favorite room in the house! The most extraordinary piece in the kitchen, in my opinion, is the coal stove. 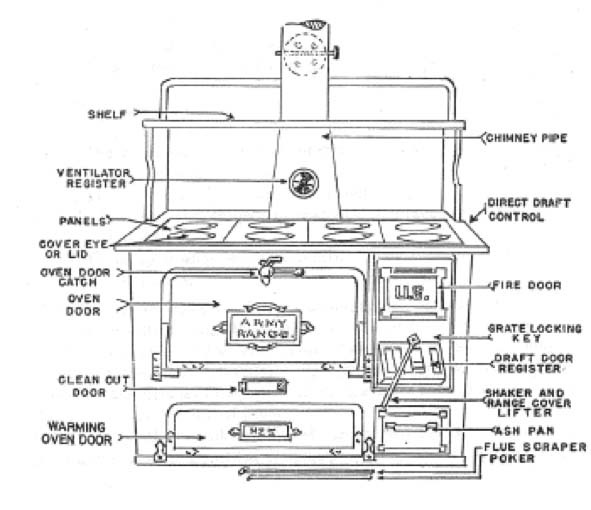 The stove was purchased at the 1894 World�s Fair in Chicago. Amazingly, the purchasing family, the Van Dorns, were able to travel to Chicago, see the stove on display, purchase it and have it shipped back to Steamboat Springs. 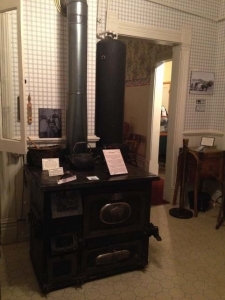 The Van Dorn�s used the stove until 1960 when it was gifted to the museum. The stove is not original to the house. I think the original home owners, the Zimmermans, most likely had a similar stove in the same location as the one on display because the stove pipes and heat registers in the ceiling are in their original location. Stoves like this one required a lot of attention. Attention to the coal amounts, fire and heat variations, and constant cleaning. The kitchen range had to be thoroughly cleaned and polished to shine. If the range was not properly cleaned after each use, the heated metal and smell of scorched food overwhelmed the house. To polish the stove, often a limestone material was used. Remember, no detergents were available at this time. The abrasiveness of the limestone polished the steel and iron parts of the stove, as well as lots of other things too like wood floors and pots and pans. The work of heating a home and feeding the family was never done for pioneer and Victorian women. With our modern conveniences of today, we may never fully understand our predecessors� plights. All we can do is peak back into their world through the displays at the Tread of Pioneers Museum�s Victorian House. The Tread of Pioneers Museum is open to visitors Tuesdays through Saturdays, 11 am to 5 pm. Come and visit us, I�ll meet you at the �black circles� and we can talk about the other fun details throughout the house! Heat register on upper floor of Tread of Pioneers Museum�s Victorian house.